We are David & Kathleen Jeffers. It's been our pleasure to present Gospel programs all over the country. We use Magic, Clowning, Story Telling, Puppetry, Face Painting and Balloon Animals to shrare God's love with all who will listen. We have been doing this for over 25 years. You name it and we've probably presented the Gospel at it. 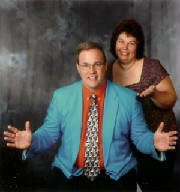 We have also served as lectures at Fellowship of Christian Magicians conferences and One Way Street Teaching festivals. It's our hope that this site will serve to teach others to keep on using their gifts to share God's message.